Some dolphins also help fishermen with their catch, and they frequently approach and play with humans in the water. Also, don’t forget that these are highly intelligent creatures with a brain structure not too far behind humans. In other words: we can relate with them and vice versa. The following true stories of dolphins saving people reveal just how far dolphins will go to protect, guide and save humans from drowning and sea predators. 1) Todd Endris, 28 August 2007, California, USA. Todd, who was 24 years old at the time, was a passionate surfer and went to practice his favorite sport with a group of friends. Not long afterwards, he was attacked by a 12 to 15 feet long great white shark and bitten thrice. The attack was so severe that he lost the skin off his back and the shark mauled his right leg down to the bone. Suddenly, a pod of dolphins showed up and circled the injured surfer till he was able to catch a wave and get back to shore. He survived the attack and remained ever grateful for the help of the dolphins. Todd’s story made headlines worldwide and is one of the most popular stories of dolphins saving humans. Hardy Jones is a well-known wildlife filmmaker and is a popular voice against the cruel treatment of dolphins in Japan. In one of his documentaries, he captures a story about how he was almost attacked in the water along with his crew if not for the quick intervention of the dolphins around them. Four young dolphins from the pod continuously dive-bombed the shark till it gave up and swam away. 3) Group of Lifeguards, New Zealand 2004. A group of four lifeguards and a woman were training at sea when they were saved form possible death by a group of dolphins. Initially, the group was unaware of the presence of a great white shark till it was already very close. Fortunately, a small pod of dolphins swam over and began to make a lot of noise and beating the water repeatedly with their tails till the shark gave up and swam off. 4) Davide Ceci, Southeast Italy. Davide, a teenage boy, was sailing in his parents’ boat when he fell off into the sea. Unfortunately, he did not know how to swim. He was moments away from drowning as he sank into the water. Then a dolphin appeared under him and began lifting him out of the water. The dolphin question was Filippo, a well known animal to the locals. 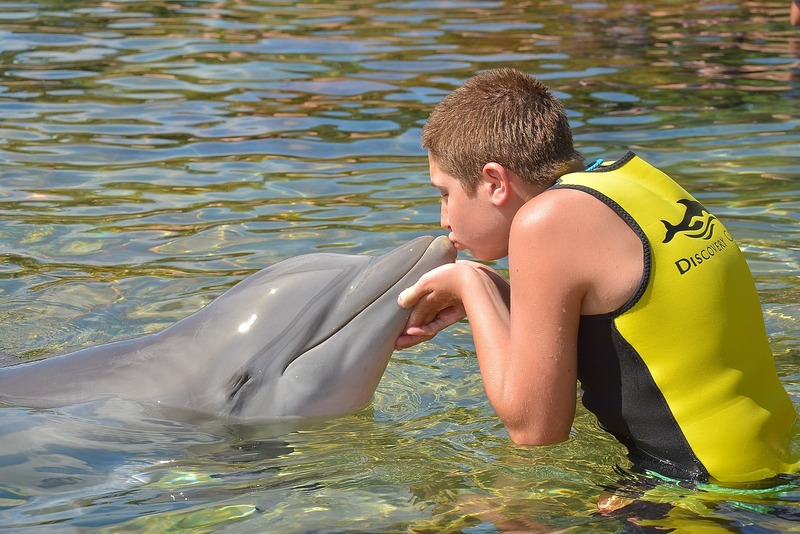 Once Davide realized what was happening, he held on to the dolphin till his father was close enough to reach down and pull him back into the boat. “When I realized it was Filippo pushing me, I grabbed onto him” – Davide Ceci. 5) Grant Dickson, 2002, Australia. 36-year-old Australian, Grant Dickson, went fishing with a group in northern Queensland. Some hours later, the vessel collapsed into the water. Grant found himself alone in the middle of the ocean, injured and holding on to the remaining bits of the boat. He was bleeding profusely and was horrified to notice a group of sharks circling him. However, a pod of dolphins also appeared and began to circle him. Eventually, the sharks gave up and Grant was rescued. 6) Red Sea Dolphin Squad. A pod of dolphins surrounded a group of 12 divers who had accidentally strayed into shark-infested waters. The dolphins protected them for 13 hours and kept circling them until another team of rescuers arrived to check on the divers. The dolphins also helped the rescuers know where to look for the divers. 7) Adam Walker, April 2014, New Zealand. Adam Walker is a renowned long distance swimmer but he almost got more than he bargained for during a swimming challenge. He went on a tasking eight hour and 36 minutes swim across the freezing waters of the Cook Strait when he noticed a very large shark-like shape beneath him. Luckily, the shark never came any closer as a pod of about ten dolphins came to his help swimming alongside him for about an hour while he crossed the strait. Obviously, a dolphin’s sonar can penetrate a human body and will sense us in the water around them. As fellow mammals, is it possible that these amazing creatures understand our frailties in the water and acknowledge the fact that we can drown if left unassisted? In addition, do dolphins realize that humans stand very little chance of survival against a predator bent on attack? All indications imply that they do. In conclusion, dolphins are intelligent creatures no doubt about that. They can assess a dangerous situation, weigh it and decide on why and how to help. They are intelligent mammals with an advanced sense of self-awareness and that’s why they live in closely-knit pods that care for every member of the group. I love dolphins and how great they are. They have saved lives and have helped people that can’t do stuff that other people can. But why do they sometimes just ignore people in the water and not swim with the people or save lives?